It’s a strange thing to find yourself slipping into the rhythm of daily life in an unfamiliar world. I’ve been in Lima four weeks now and my days are starting to take on a more familiar shape. Two weeks ago I moved into an enormous share-house. Eight of us – a mix of Peruvians and other foreigners – share 6 bathrooms, 2 lounge rooms and 1 kitchen. It’s a big adjustment after 18 months of living alone in the Cottage and was pretty nervous about moving in given how badly I coped with a share-house of 4 in uni. I’m slowly getting used to the noise of others coming and going, and thankfully the others don’t much use the kitchen (and I have my own en suite bathroom) but it’s still taking a lot of adjusting and I’m still horribly under-slept. There’s just too much happening in my poor brain to get good quality rest. Changes come thick and fast and the challenge is finding enough down-time to process all the new information that’s super-saturating my brain so I can wind down enough for sleep. It’s not helped by a culture where plans are made at the last-minute and you suddenly find yourself with an unmissable invitation on the day you were planning to catch up on sleep. There’s always something going on here in Lima. Tourisiting at L’arco Mar, Miraflores. The “green coast” project hems the wealthy suburbs with improbable palm trees on the desert’s edge. 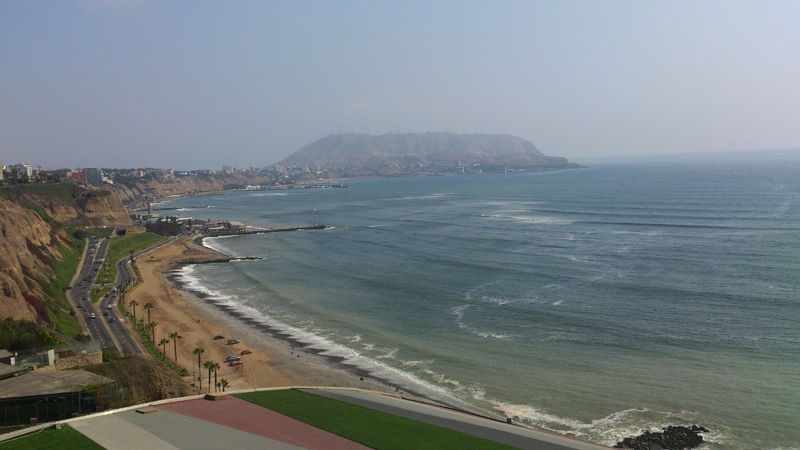 Lima… this mega-city is an entirely different world to the Peru I’d seen before, to the Andean sierra I love. With almost 10 million people squeezed in together between the desert and the sea it’s a crowded and chaotic place. The traffic snarls its way slowly through hopelessly congested streets, the horn-blasts of frustration and shrill whistles of the traffic police the inescapable sound-scape of my evenings. It would possibly help if drivers bothered to obey the road rules. I’ve seen 4 lanes of traffic on a 3-lane highway; turning off round-abouts from the inside lane; going the wrong way up one-way streets, in reverse. He with the steeliest nerves wins, just don’t blink (or close your eyes and hope your cab driver’s a good one – I’ve been lucky thus far). I’m glad to not drive. I’m getting by on public transport and my own two feet just fine, although the minibuses I take each work morning provide an adventurous ride. It’s amazing how many people you can fit on one of those things, if you really try, and they usually leave just enough space to get the door closed. I don’t mind riding in the doorway though: the air’s fairly fresh at the early hour I leave for work and the buses rarely reach speeds that get the adrenaline up. In the evenings it’s faster to walk home from the Metropolitano stop and most days the afternoon sea breeze helps to soothe nerves frayed by noise of it all. It’s a strange thing after so many years down in Tassie to live somewhere with such predictable weather. It never rains in Lima. At this time of year the mornings are warm and humid, with low, grey skies hanging over the city. Donkey-belly skies, they call them, thick and hazy. Now it’s coming into summer we’re getting more blue sky and most days the sun makes some degree of appearance, and the less humid afternoons are cooled by the breeze. It’s warmer in the wee hours of the morning than when I’m on my way home from work. 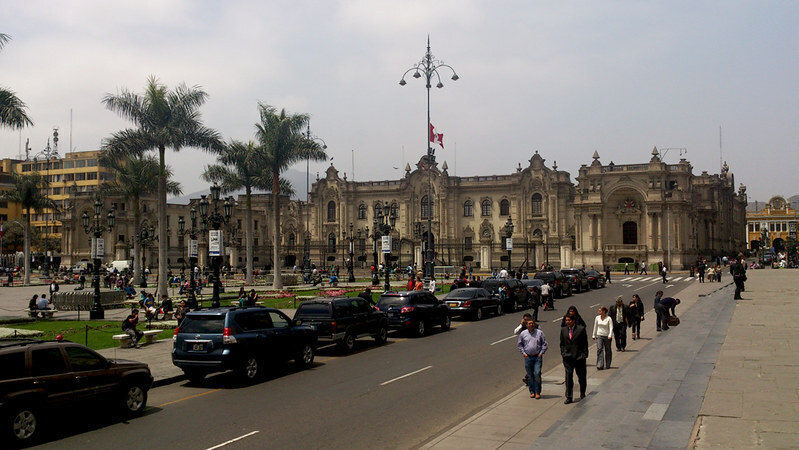 Plaza Mayor and Palacio del Gobierno, Lima Central. I miss the variety of weather back home. I miss the drama of the sky and seeing the stars at night and the healing act of rain. In a desert city full of car exhaust the humidity sticks a layer of dust and grime on every surface, with no rain to wash it clean. I can feel it on my skin and look forward to scrubbing it off each night before bed. I miss real green. I’m lucky enough to live and work in the wealthier suburbs with plenty of parks, but they are pale imitations of real green places, and I can’t ignore the social and environmental costs of them. Lush lawns take a lot of water and it doesn’t seem right to be growing the stuff when on the other side of the city people live cheek-by-jowl in shanties that tumble down the dust of desert foothills. The inequality of it all is offensive, and just to rub in the ridiculousness of it all in some places you’re not allowed to sit on the grass: the park police will get worked up and direct you to the benches where you’re supposed to sit. I need to work on getting out of the city, but that’s surprisingly hard when you’re in the vast urban tangle and without a car. It takes group planning to really get anywhere interesting and I haven’t managed it yet. I’ll get there. I have carved myself out small echoes of familiarity. The walk between the bus-way and work; the organic market on Sundays for beautiful veg; plunger coffee to start each morning. At the same time I’m embracing the new: kiwicha porridge with exotic tropical fruits; bartering with the taxi drivers over the fare; learning more Spanish each and every day. I’m meeting so many people and making friends. I’ve an ever-growing list of places to visit and things I want to do. 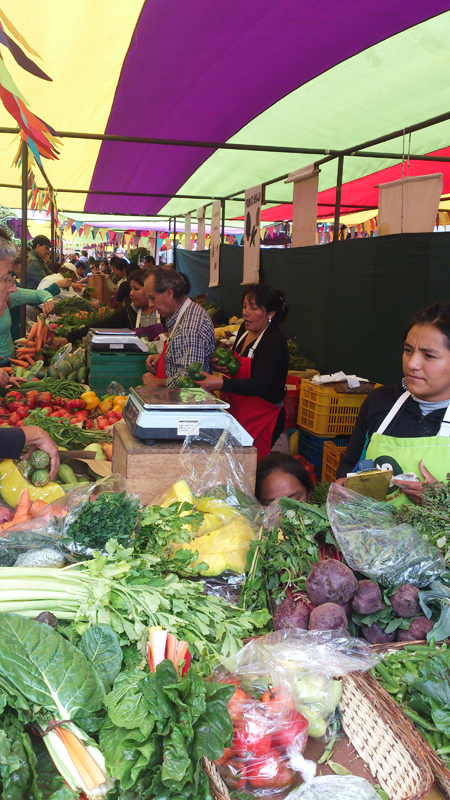 Bioferia organic produce market, Sunday mornings, Surquillo, Lima. There are entire lakes and rivers where the fish fauna has never been surveyed and I have people who’d happily take me there and hand me a net. Amazing. In several places there are no roads to follow: you fly in then go by boat. Combinations of plane, bus and collective taxi are needed to get around and time is short, working more-than-full-time. I need to see these places. I must! Where’s my teleport already? I’ve only been a month in Lima, yet Hobart feels so very long ago. Another day ends all too soon. 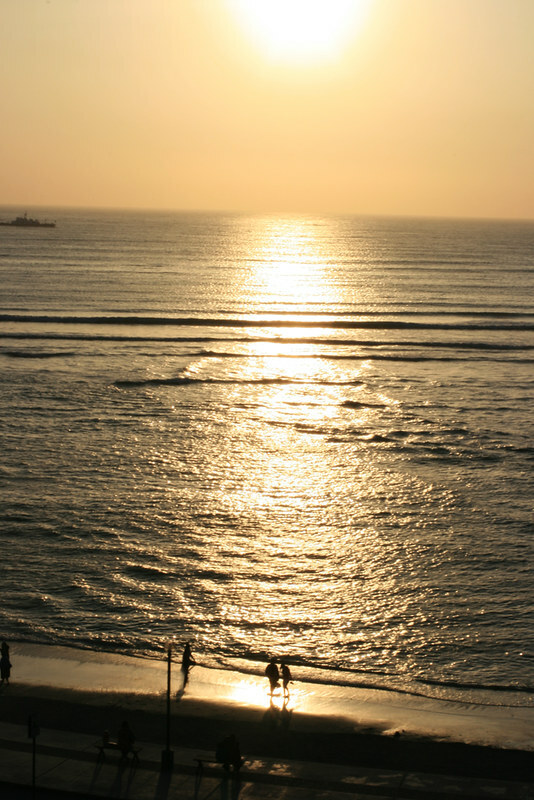 Sunset from Barranco, Lima. So excited to read how you are getting on… what an amazing place to be. Thank you. I’m desperate to get out exploring, I just wish it wasn’t quite so challenging to get around! You captured my imagination with your description of the city and I decided never to go there 🙂 Sounds like your inching to get out into the wilds, as I would be, fingers crossed that your work takes you there soon. Thanks Eddie, when I applied for this post I knew living in Lima would be my biggest struggle. New culture, foreign language, far from home? No sweat. City of almost 10 million where it never rains? Eeep! I’m counting down the days until I have time to travel. Loved reading this, since I can’t travel right now, I can live vicariously through you. Thanks for sharing your adventures Toni!